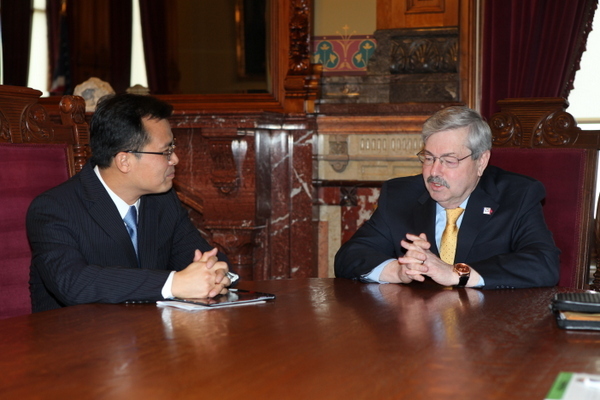 Consul General Zhao expressed high appreciation to Governor Branstad for his consistent efforts to promote friendly exchanges between China and the United States. He said that Chinese Vice President Xi Jinping's visit to Iowa in February 2012 was a milestone in the development of China-Iowa relations, and the Chinese side is ready to push forward its exchanges and cooperation with Iowa in the years to come. Governor Branstad recalled his fond memory of Vice President Xi's historic visit to Iowa. He felt honored with the visit and pledged to make continuous efforts in promoting Iowa-China relations. Commercial Counselor of the Consulate Chen Guowen attended the meeting.